And given that it’s a double wedding, there’s two sets of images for you all, so I’d definitely recommend making a cup of tea and getting comfortable to enjoy this one. 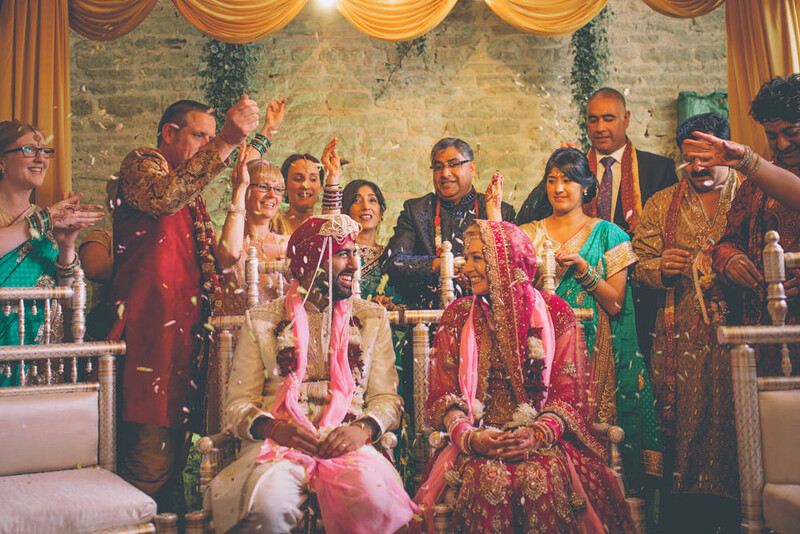 There’s the elegant civil ceremony followed by a big knees up in a field, then there’s the vibrant Indian wedding ceremony filled with colour, followed by a rustic styled Eastern feast at the gorgeous Merriscourt in the Cotswolds. 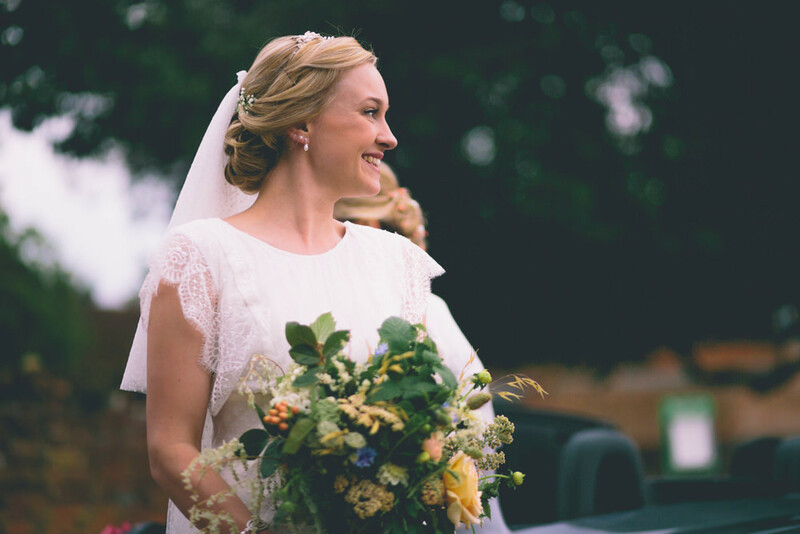 Jessica The Bride: The hunt for the English wedding dress started 12 months out. I knew I liked lace and I have always had a fondness for old/vintage design but that’s all the criteria I had. As I tried on dress after dress it soon became clear that the vague notion of what I wanted didn’t really exist. Time was running away and before we knew it we were 5 months away from the wedding with no dress! My Mum and I were driving through Towcester when we spotted another bridal boutique, not holding out much hope we parked up and popped in. It was incredible! When I saw a dress from the Belle and Bunty range I thought I had found ‘the one’, but sadly it was WAY out of my budget! It took another month before stumbling across Boutique Cholpon in my hometown. I saw a white dress through the window and went in to check it out. It wasn’t right but the shop assistant told me to come back with some images of what I liked and speak to the owner. Cholpon was lovely, she looked at the pictures I gave her and she said she would speak to her designer back in Ukraine. A week later Cholpon told me her designer could do it! It took 3 weeks before I saw swatches of lace and another month before I saw photos of the pinned article. It was beautiful. The designer had taken all the key elements of the Belle and Bunty dress I had fallen in love with and had crafted something phenomenal. It was perfect, more perfect than the original dress I had discovered and what made it even more special was that no one else would have this dress. It was bespoke and made solely for me. For the Indian ceremony I wanted to wear a traditional outfit that was in the red/pink spectrum. I could choose from a Saree or Lengha design. At this point I had never heard of a Lengha but learned that it was a two-piece outfit and was the more contemporary of the two. After many visits to the likes of Leicester, Birmingham and Wembley I soon discovered that pink was definitely my colour. In a little shop called Traditions I found a beautiful pink, with a touch of burnt orange, wedding Lengha. It was heavily embellished with antique gold thread, pearls and clear stones. All through my search I had said that I didn’t want something too heavy but that went straight out the window when I saw my wedding Lengha! It was the one for me and we set about finding the perfect accessories to match! Sandeep wanted something a little different to the traditional wedding suit for the Civil Ceremony, but wanted to still remain smart. Whilst it was too hot for tweed, he liked the idea of a blue checked suit and floral tie, just to add his own little twist to things. He also had a pair of deer print cufflinks, which with the tie and buttonhole stuck to our woodland theme. The Indian suit (Sherwani) however was a little different. Sandeep wanted something very traditional, but not as flamboyant as some. After searching for a while he found the perfect suit hanging on a mannequin in Leicester! The additions to the Sherwani (scarf, shoes, turban) were all picked to match the bride perfectly. In fact, the turban was wrapped on the day by a family friend back home! The English ceremony venue was chosen as a point of difference from the venue we had chosen for our Indian ceremony which was barn like in appearance. 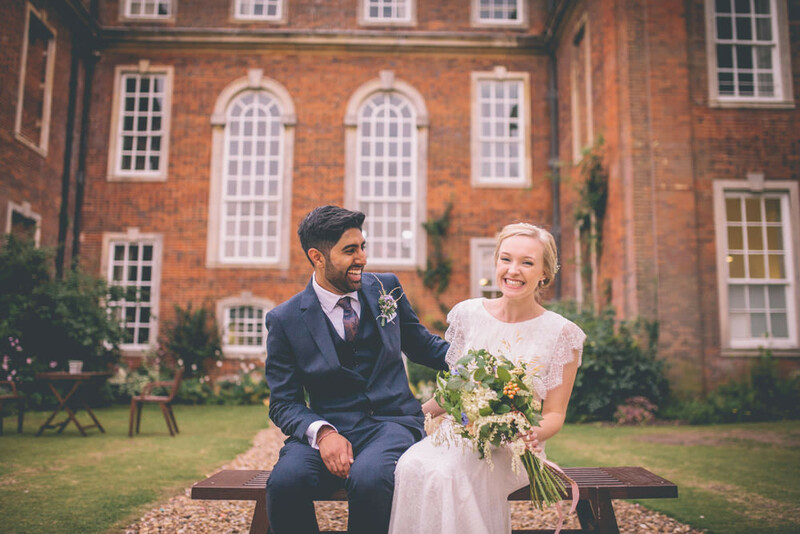 Chicheley Hall offered us a quintessentially English setting with lots of scope for great photos. We wanted the ceremony to be small and intimate as we were having so many people to the Indian shindig. We chose the venue for the Indian ceremony long before the English. A lot of Indian weddings are held in giant to accommodate hundreds, but we wanted something different, something more remote and rustic that would allow the two cultures to come together. 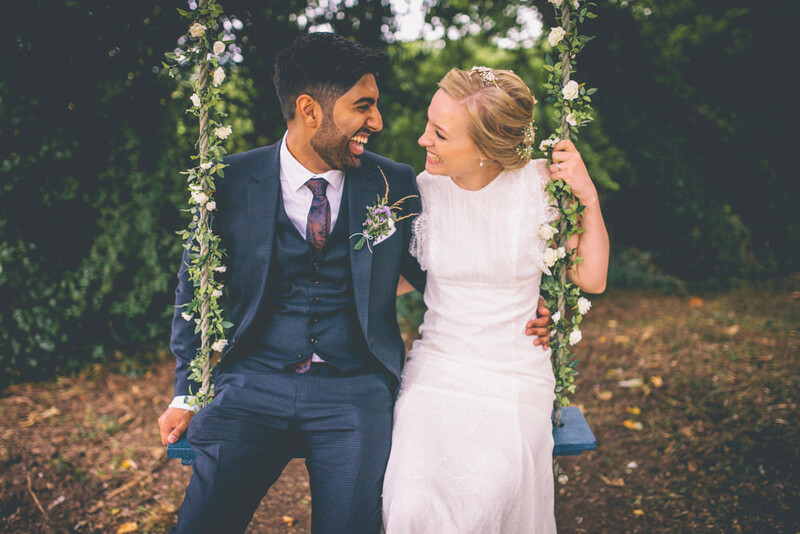 Our search for a venue that had several reception rooms (in case we had bad weather), beautiful surroundings, allowed us to have Indian caterers, to have an open fire and didn’t blow our entire budget was pretty tough! After many months of visiting potential venues we finally found Merriscourt in Chipping Norton. The venue had their own in-house caterers but regardless of this they were completely open to us having Indian Caterers. We couldn’t believe our luck. Finally, we had found our perfect venue! 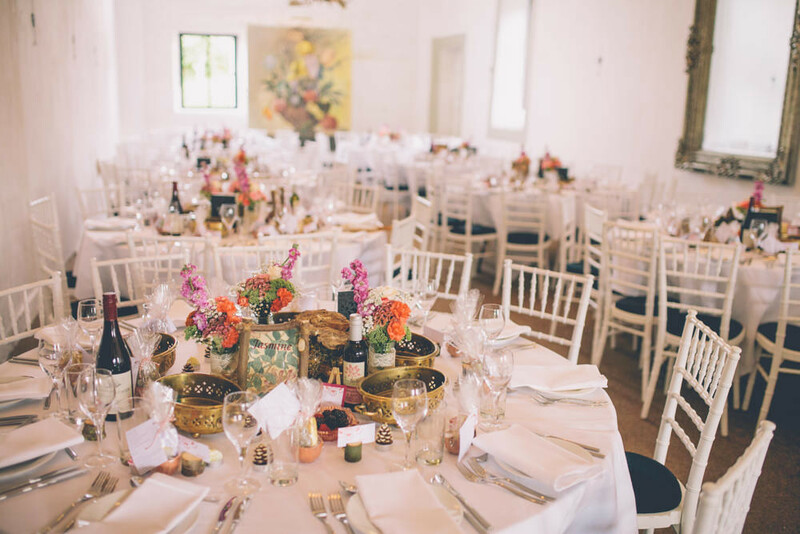 The vision was to have a relaxed, country-wedding surrounded by flora and fauna. Our dear friends had bought a piece of land in their village which was completely surrounded by trees and fields. Family and friends had spent many an evening at ‘The Land’ enjoying the delights of a smoky bonfire whilst cooking up jacket potatoes and beans. 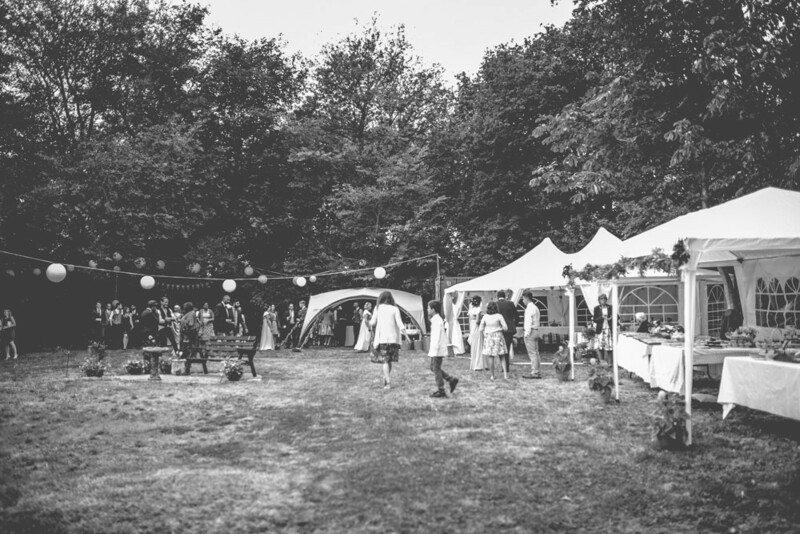 The Land held such fond memories for me that it seemed like the perfect location to host our English wedding reception. 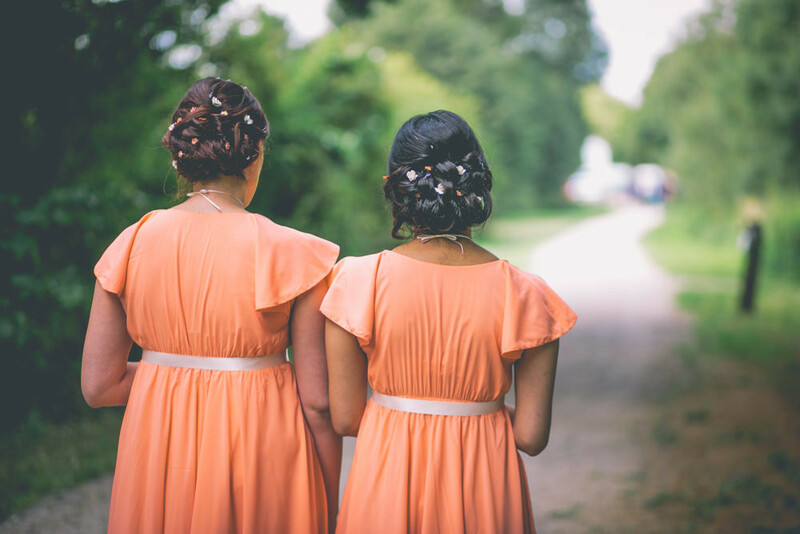 We had chosen a peach colour for the bridesmaid dresses and from here the colour scheme grew to include powder blue, purple, white and green. 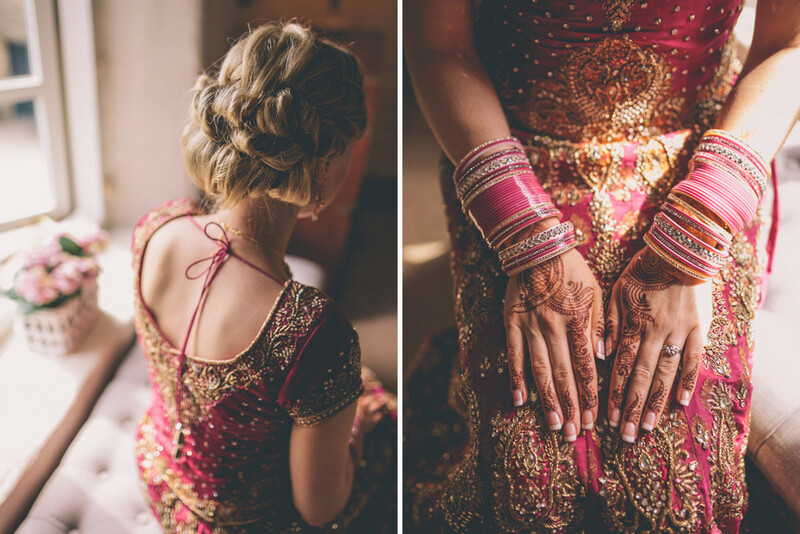 The Indian Colour scheme was Indian pink and burnt orange; colours pulled out from my Wedding Lengha. Continuing the woodland theme from the English wedding we used the lace covered jars, pretty pinecone candles and gnarly twiggy table name holders. These themes of colour and nature were pulled through in all aspects, from the Mandap, to the flowers to the wedding party. The flowers were chosen from Hillyards Flower wholesalers 2 week prior to the wedding. We popped in and decided on the flowers and the colours from the selection of in season blooms. The bride bouquet was made at Field Gate Flowers and I had wonderful consultation in the summerhouse where straw like grass and lavender hung from an old, wooden, pully airer. Alison, my florist, looked at the various pictures I had printed off and we sat together deliberating the types of flowerers that were in season that would fulfil the colour scheme and the wild ‘just picked in a field’ look I wanted. Whilst the entertainment for the civil ceremony was provided by friends and family on the day (big speakers and an iPod on the land), the Indian ceremony was a little different. We knew that picking “English” tracks to give to the DJ to play was going to be easier than the other way round, so we went with an Indian DJ from Calibar. After our first dance (which we decided to have at the Indian ceremony), we planned a couple of Dhol Players (Indian drummers) to play a set to really get the energy going. From then on we handed the music back over to the DJ who played a mix of English and Indian songs until the early hours! From the get-go we knew that picking the right photographer was one of the most important decisions for us. Much like with the venues, we spent a good few months searching for someone who was up for shooting two very different weddings! We came across Story & Colour (Dan and Laura) and were just blown away by the style, quality and variety of pictures in their portfolio. After a “meeting” at a local burger-joint and literally no deliberation on our part, we knew they were perfect for us, and we couldn’t be happier! Having a videographer was a topic of discussion for a while, until we came across Artistic Motion. Their simple, yet beautiful shots were really what we were looking for, and the fact that we could use them again on both days really helped us out. 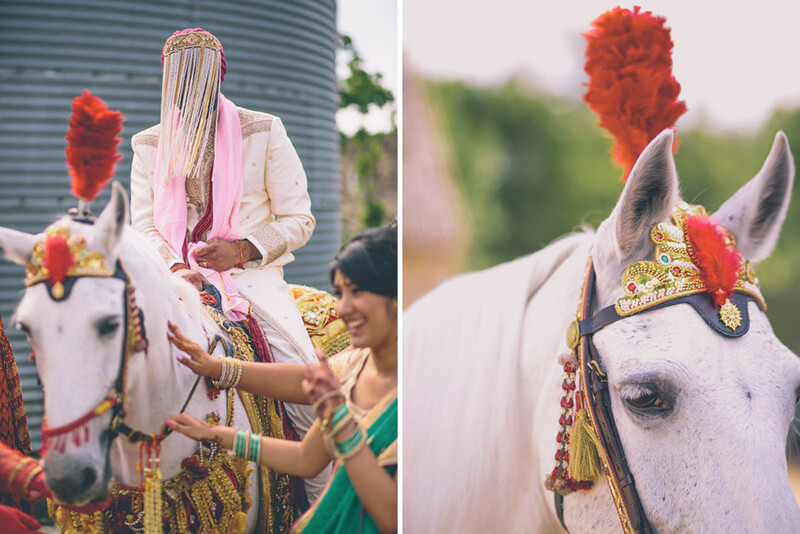 Their experience with Indian weddings and their unique style made them the perfect choice for us. I think this must be the happiest bride of all time! Congrats, what beautiful photos! Hi Jenna, the cake was made by a friend and I dressed it myself ?